The Aesthetics Crew is Aidge & Indy, assisted by the ringmaster Mixmaster Wolf. From the PL70 website: "Step right up, step right up, ladies and gentlemen your ears are about to bare witness to the most diabolical show on Earth! Based on a now legendary series of weekly get togethers known throughout LA musical circles as "Funky Fridays," The Family Circus mixtape is the result of bottomless bottles, endless smoke breaks, and late nights that turned to early mornings that turned to long weekends. This death defying, party heavy show features collaborations between some of the funkiest producers, DJ's, MC's, & live musicians known to man, including Aidge, Indy, Mixmaster Wolf, LA Mike, Chris Clarke, Pause, L. Scatterbrain, Count Bass D, Rahkwon, Olde Soul, Blak King, Malyque "Hoss" Smith, Iful, and David Bergsma. Music like this is only fit for 2 places: under the bright lights of the big top, or locked in a cage kept far away from any sane human being. Be afraid, but be intrigued…"
Tracks 2, 4-5, 7, 9-12, 16-17, 19 & 21 produced by Indy. Tracks 1, 3, 6, 8, 14-15, 18, 20 & 24-25 produced by LA Mike. Tracks 13 & 23 co-produced by Indy & LA Mike. Track 22 produced by Olde Soul. Cuts on tracks 4, 6, 7, 13 by LA Mike. Guitar on track 23 by David Bergsma. Mixed and Mastered by Hans Crump. Executive Produced by Slave & Injun. Album Cover Art by Adalberto "Otra" Ramos. Album Design & Layout by Aidge. 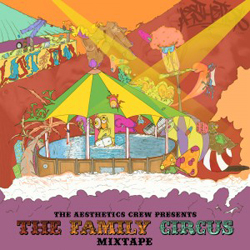 Internet mixtape: PL70.net (2012) (Free archival download located here: http://pl70.net/downloads/the-aesthetics-crew-the-family-circus-mixtape/).